Bakersfield Observed: Bakersfield Commons: is the huge development at Coffee and Brimhall about to become reality? 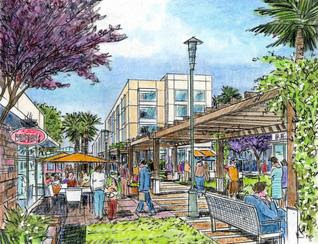 Bakersfield Commons: is the huge development at Coffee and Brimhall about to become reality? How many times have you passed that huge swath of undeveloped land at Coffee and Brimhall roads and thought: why hasn't this ever been developed? Well, got an update on the long-stalled project there, called the Bakersfield Commons, when project rep Daniel Niemann briefed the downtown Rotary club. The owners, World Oil, have ambitious plans for a huge retail, office park and residential development that - at least on paper and in PowerPoint - looks upscale and a definite plus for our community. Niemann is talking anchors like Dillard's, Macy's, JC Pennys and boutique retailers all surrounding lush greenery, pedestrian malls and housed on 255 acres. He says the closest thing to it is Victoria Gardens in Rancho Cucamonga, which I haven't seen. The project has been stalled in the city over traffic impact issues but Niemann claims this is classic infill - hard to argue with that given its location - and that he has even received the blessings of the Sierra Club. The project is planned over 20 years and the first phase includes 800,000 square feet of retail and 200,000 square feet of office space. Eventually they claim there will be movie theaters, modern offices, parks, possibly a police substation and GET bus transit center and lastly - 80 single-family homes built in the first, second and third phases of the project. If you want to tour its website, check it out here. I've been in town long enough to remember when there were plans for a water slide park there, and I've always been puzzled why this prime acreage has not been developed. And there's always the question why anyone - any developer - would want to move forward in this lousy economic environment when capital is so hard to come by and retailers are cutting back, not expanding. My guess? The City Council will give its blessing. We'll have to wait and see exactly what develops over the next couple decades. Niemann said with City Council approval, they'll be moving dirt within the year. Nice pictures, but now it's time to deal with reality. It's good to look into the future, but right now we have existing and available retail spaces, with exiting taxpayer-funded infrastructure, that were built to handle retail uses. Bakersfield simply has too much empty retail space. I know the Commons developers are talking 20 years out, but let's do something new and exciting right now, like filling up what we already have before we go out and build new stuff that tends to drain the older retail centers. We have lots of retail blight. Look around: How about filling up one of our regional malls that has three anchor spaces--all of them empty. How about filling up the empty stores that retailers like Vons and now CVS leave around town as they merge and relocate, leaving nearby retailers to suffer with fewer customers, and neighbors to deal with graffiti and unkempt properties? The Commons people say good things, but Macy's? Penneys? They would open new locations so close to their present ones in Valley Plaza? Even 20 years out that seems questionable. Also keep in mind that Bakersfield is primarily a mid- to lower-income kind of place. Keep a watch on Kohls and how they are handling vacated Mervyns sites around California. Ready-made stores in the middle of existing retail centers, rather than out in the outskirts of cities. so when is world oil going to atleast clean up the eye sore of the old pg&e substation?